The announced disaster - it happened. After a visit to the 1.400 strong Dutch NATO-ISAF contingent in Tarin Kowt (Uruzgan, Southern Afghanistan), Dutch PM, Jan Peter Balkenende, participated in a press conference with Afghan president Hamid Karzai. Karzai complained, that US-led forces had provoked Pakistan critics who support "taliban" insurgency. The Dutch are into the Afghan morass over their (horrible) sunglasses and ears. KABUL, Afghanistan, Aug. 26 — President Hamid Karzai said Saturday that recent criticism of his leadership and his administration stemmed from disagreements that he had had with some partners of the United States-led coalition in Afghanistan over the conduct of military operations. 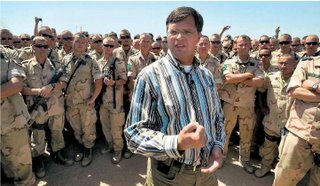 “For some time, some circles of the Western media have started special propaganda against me and the Afghan government,” he told journalists at a joint news conference with Prime Minister Jan Peter Balkenende of the Netherlands. Translation: The Indian secret service, in order to create diversion from the Kashmir rebellion, supports anti-Pakistan movements in Baluchistan and the Pashtun area and the military government of Pakistan has a policy of severe repression against those rebellions. Saturday, the Pakistan army killed a former minister and important Baluch clan leader, Bugti. Demonstrations, strikes, manifestations all over the Baluchi Sindh, the Baluchi and Pastuni areas. A connection with the "Peters" document, published recently in the Pentagon Army Weekly, which proposes a "Free Baluchistan" country, independent from Pakistan, cannot be excluded. Mr. Karzai has recently come under sharp criticism at home and abroad for failing to protect the country from violence and manage the economy, and for allowing widespread corruption in his government. And as the insurgency has worsened, confidence in his leadership has fallen. In the real world, the "Taliban" are virtually non-existant. It is all about clanic rule. Pakistan's military ruler Muzarraf does not control the powerful secret service ISI, that foments tribal insurgence in Afghanistan. After the American retreat, the European NATO-ISAF forces are left to deal with their creations. No help from the powerless Karzai. In response, he has repeatedly blamed the worsening insurgency in southern Afghanistan on infiltration from Pakistan, and has called on the United States and its coalition"
Again: A unified EU policy to stabilise Afghanistan, promote talks with local lords in the way Karzai has repreatedly proposed, combat Indian as well as Pakistani ingerence, could still work. Left alone, the English-Australian-Dutch military will not be able to do anything else as to terrorize local insurgents and create a strong movement against the West. Some imagination and courage is needed. Could it come from Brussels? Those "horrible sunglasses" could just mean the difference between being blind for the rest of your life or not. They offer ballistic protection against all sorts of shrapnel. They can fit different type of glasses in them, transparent, yellow or black. Next time do a bit of research.